Yesterday's post was all about Alibaba. Today's post, though, will be all about Amazon. Where words are concerned, I feel like I may trust them more. If you're a single lady and you'd like everyone to know (or at least to stop asking), then perhaps you've considered wearing a sign. But if you're driving, a sign can be a little awkward with that seat belt. Instead, why not get a collection of tees that will tell everyone without making you too uncomfortable. Let's look at your options. You may have noticed that the majority of these tees reference food. What's better than guys? Well, a lot of things, but food is definitely one of them. And pizza? Well. I don't think I need to tell you it's wonderful. 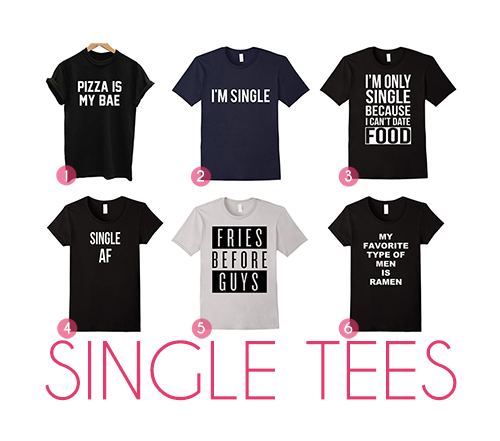 If you're single and looking, this tee is clear and to-the-point. But you know..even if you're not looking, this may actually answer any of those pesky questions bout whether or not you're seeing anyone. No. You're not. You're not seeing anyone. You're single. Thank you for NOT asking. Sometimes I pretend I'm dating food anyway, though. Perhaps this is too vulgar for you, but sometimes a spinster can feel exactly this single. Guys have a saying about putting their friends before their girlfriends. But girls have had a little harder time. I've heard "ovaries before brovaries," and I've heard "sisters before misters," but somehow "fries before guys" speaks to something all together different in the spinster's soul. Namely, the hungry part. Have you been disappointed by men so many times you just aren't even looking anymore? If you know the right restaurant, ramen can never let you down. If you're cheap, Ramen won't let you down at home, either. All right. I hope you got a little giggle out of these. Happy Tuesday! I've Started Shipping Christmas Orders!